Do you remember this Bisquick Coffee Cake Recipe? Well I certainly remember this Bisquick Coffee Cake recipe! It's found on every box of Betty Crocker's Bisquick! Believe me, nothing could be easier to whip up. Once you read the list of ingredients, you'll understand what I'm talking about. 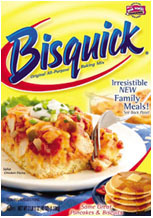 If you don't already own a box of Bisquick then jump into your car, ride your bike or just walk to your closest grocery store and pick one up! It'll change your life and the way you think about preparing coffee cake, pancakes, waffles and whatever other recipe Betty Crocker could think of! Let us know what you think or if you'd like one of your favorite recipes featured on our site, please let us know! Mix all ingredients in small bowl until crumbly. Set aside. Mix in a 1/4 of the Streusel topping and spread in pan. Cover the cake batter with the remaining Cinnamon Streusel. Bake 18 to 22 minutes or until golden brown, testing with a toothpick for doneness.